Upper respiratory tract infection (URI) represents the most common acute illness evaluated in the outpatient setting. URIs range from the common cold—typically a mild, self-limited, catarrhal syndrome of the nasopharynx—to life-threatening illnesses such as epiglottitis (see the image below). 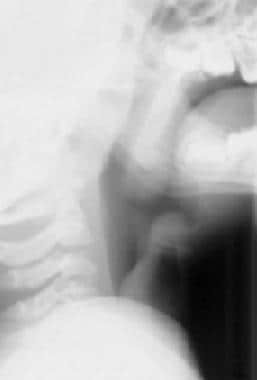 Lateral neck radiograph demonstrates epiglottitis. Courtesy of Marilyn Goske, MD, Cleveland Clinic Foundation. Details of the patient's history aid in differentiating a common cold from conditions that require targeted therapy, such as group A streptococcal pharyngitis, bacterial sinusitis, and lower respiratory tract infections. Clinical manifestations of these conditions, as well as allergy, show significant overlap. In older children and adults, symptoms (eg, pain, pressure) tend to localize to the affected sinus. Tests of nasopharyngeal specimens for specific pathogens are helpful when targeted therapy depends on the results (eg, group A streptococcal infection, gonococcus, pertussis). Specific bacterial or viral testing is also warranted in other selected situations, such as when patients are immunocompromised, during certain outbreaks, or to provide specific therapy to contacts. Blood cultures are typically appropriate only in hospitalized patients with suspected systemic illness. Imaging studies are warranted in patients with suspected mass lesions (eg, peritonsillar abscess, intracranial suppurative lesions). Symptom-basedtherapy represents the mainstay of URI treatment in immunocompetent adults. Antimicrobial or antiviral therapy is appropriate in selected patients. Upper respiratory tract infection (URI) represents the most common acute illness evaluated in the outpatient setting. URIs range from the common cold—typically a mild, self-limited, catarrhal syndrome of the nasopharynx—to life-threatening illnesses such as epiglottitis. Viruses account for most URIs (see Etiology). Appropriate management in these cases may consist of reassurance, education, and instructions for symptomatic home treatment. Diagnostic tests for specific agents are helpful when targeted URI therapy depends on the results (see Workup). Bacterial primary infection or superinfection may require targeted therapy (see Treatment). The upper respiratory tract includes the sinuses, nasal passages, pharynx, and larynx, which serve as gateways to the trachea, bronchi, and pulmonary alveolar spaces. Rhinitis, pharyngitis, sinusitis, epiglottitis, laryngitis, and tracheitis are specific manifestations of URIs. Further information can be found in the Medscape Reference articles Acute Laryngitis, Acute Sinusitis, Allergic Rhinitis, Bacterial Tracheitis, Croup, Epiglottitis, Pharyngitis, and Viral Pharyngitis. URIs involve direct invasion of the mucosa lining the upper airway. Inoculation of bacteria or viruses occurs when a person’s hand comes in contact with pathogens and the person then touches the nose or mouth or when a person directly inhales respiratory droplets from an infected person who is coughing or sneezing. Adenoids and tonsils contain immune cells that respond to pathogens. Humoral immunity (immunoglobulin A) and cellular immunity act to reduce infections throughout the entire respiratory tract. Resident and recruited macrophages, monocytes, neutrophils, and eosinophils coordinate to engulf and destroy invaders. A host of inflammatory cytokines mediates the immune response to invading pathogens. Normal nasopharyngeal flora, including various staphylococcal and streptococcal species, help to defend against potential pathogens. Patients with suboptimal humoral and phagocytic immune function are at increased risk for contracting a URI, and they are at increased risk for a severe or prolonged course of disease. Inflammation (chronic or acute) from allergy predisposes to URI. Children with allergy are particularly subject to frequent URIs. Person-to-person spread of viruses accounts for most URIs. Household and child care settings can serve as reservoirs for infection. Bacterial infections may develop de novo or as a superinfection of a viral URI. Viral agents occurring in URIs include a vast number of serotypes, which undergo frequent changes in antigenicity, posing challenges to immune defense. Pathogens resist destruction by a variety of mechanisms, including the production of toxins, proteases, and bacterial adherence factors, as well as the formation of capsules that resist phagocytosis. Incubation times before the appearance of symptoms vary among pathogens. Rhinoviruses and group A streptococci may incubate for 1-5 days, influenza and parainfluenza may incubate for 1-4 days, and respiratory syncytial virus (RSV) may incubate for a week. Pertussis typically incubates for 7-10 days, or even as long as 21 days, before causing symptoms. Diphtheria incubates for 1-10 days. The incubation period of Epstein-Barr virus (EBV) is 4-6 weeks. Most symptoms of URIs—including local swelling, erythema, edema, secretions, and fever—result from the inflammatory response of the immune system to invading pathogens and from toxins produced by pathogens. Inflammatory narrowing at the level of the epiglottis and larynx may result in a dangerous compromise of airflow, especially in children, in whom a small reduction in the luminal diameter of the subglottic larynx and trachea may be critical. Beyond childhood, laryngotracheal inflammation may also pose serious threats to individuals with congenital or acquired subglottic stenosis. For the most part, similar agents cause URI in adults and children; however, Moraxella catarrhalis and bocavirus cause URIs more commonly in children than in adults. Unidentified, but presumably viral, pathogens account for more than 30% of common colds in adults. In addition, varicella, rubella, and rubeola infections may manifest as nasopharyngitis before other classic signs and symptoms develop. This is most often viral in origin. Recognition of group A streptococcal pharyngitis is vital because serious complications may follow untreated disease. Other pathogens include group A streptococci and other streptococcal species. Uncommon causes include C pneumoniae, Neisseria species, anaerobes, and gram-negative rods. Nosocomial sinusitis often involves pathogens that colonize the upper respiratory tract and migrate into the sinuses. Prolonged endotracheal intubation places patients at increased risk for nosocomial sinusitis. Methicillin-resistant S aureus (MRSA) is less common than sensitive staphylococci. Gram-negative bacilli (eg, Escherichia coli,Pseudomonas aeruginosa) are other causes. Aspergillus species are the leading causes of noninvasive fungal sinusitis. Although fungi are part of the normal flora of the upper airways, they may cause acute sinusitis in patients with immunocompromise or diabetes mellitus. This is a bacterial infection. In the vast majority of children, H influenzae type b (Hib) is isolated from blood or epiglottal cultures. Since the routine use of the Hib conjugate vaccine began in 1990, case rates in children younger than 5 years have declined by more than 95%. The prevalence of invasive Hib disease is approximately 1.3 cases per 100,000 children. Rates in adults have remained low and stable; Alaskan Natives have the highest rates of disease. Other bacteria, found more commonly in adults than in children, include group A streptococci, S pneumoniae, and M catarrhalis. In adults, cultures are most likely to be negative. Croup, or laryngotracheobronchitis, is typically caused by PIV type 1, 2, or 3. PIVs account for up to 80% of croup cases. PIV type 1 is the leading cause of croup in children. Other viruses include influenza viruses and RSV. Uncommon causes include hMPV, adenovirus, rhinovirus, enterovirus (including coxsackievirus and enteric cytopathic human orphan [ECHO] viruses), and measles virus. Approximately 95% of all cases of whooping cough are caused by the gram-negative rod Bordetella pertussis. The remaining cases result from B parapertussis. Other forms of laryngitis and laryngotracheitis are typically caused by viruses similar to those that cause nasopharyngitis, including rhinovirus, coronavirus, adenovirus, influenza virus, parainfluenza virus, and RSV. Candida species may cause laryngitis in immunocompromised hosts. The incidence of the common cold varies by age. Rates are highest in children younger than 5 years. Children who attend school or day care are a large reservoir for URIs, and they transfer infection to the adults who care for them. In the first year after starting at a new school or day care, children experience more infections, as do their family members. Children have about 3-8 viral respiratory illnesses per year, adolescents and adults have approximately 2-4 colds annually, and people older than 60 years have fewer than 1 cold per year. Acute pharyngitis accounts for 1% of all ambulatory office visits. The incidence of viral and bacterial pharyngitis peaks in children aged 4-7 years. Croup, or laryngotracheobronchitis, may affect people of any age but usually occurs in children aged 6 months to 6 years. The peak incidence is in the second year of life. Thereafter, the enlarging caliber of the airway reduces the severity of the manifestations of subglottic inflammation. Group A streptococcal bacteria cause approximately 5-15% of all pharyngitis infections,  accounting for several million cases of streptococcal pharyngitis each year. This infection is rarely diagnosed in children younger than 2 years. Influenza affects approximately 5-20% of the US population during each flu season. Early presentations include symptoms of URI. Diphtheria rates fell dramatically in the United States after the advent of diphtheria vaccine. Since 1980, the prevalence of diphtheria has been approximately 0.001 case per 100,000 population. A confirmed case of the disease has not been reported in the United States since 2003. However, diphtheria remains endemic in developing countries. Although URIs may occur year round, in the United States most colds occur during fall and winter. Beginning in late August or early September, rates of colds increase over several weeks and remain elevated until March or April. Epidemics and mini-epidemics are most common during cold months, with a peak incidence from late winter to early spring. Cold weather results in more time spent indoors (eg, at work, home, school) and close exposure to others who may be infected. Humidity may also affect the prevalence of colds, because most viral URI agents thrive in the low humidity that is characteristic of winter months. Low indoor air moisture may increase friability of the nasal mucosa, increasing a person's susceptibility to infection. Laryngotracheobronchitis, or croup, occurs in fall and winter. Seasonality does not affect rates of epiglottitis. The figure below illustrates the peak incidences of various agents by season. 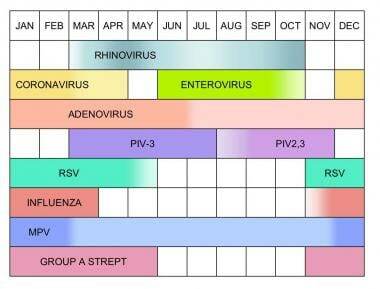 Rhinoviruses, which account for a substantial percentage of URIs, are most active in spring, summer, and early autumn. Coronaviral URIs manifest primarily in the winter and early spring. Enteroviral URIs are most noticeable in summer and early fall, when other URI pathogens are at a nadir. Adenoviral respiratory infections can occur throughout the year but are most common in the late winter, spring, and early summer. Seasonal variation of selected upper respiratory tract infection pathogens. PIV is parainfluenza virus, RSV is respiratory syncytial virus, MPV is metapneumovirus, and Group A Strept is group A streptococcal disease. Human metapneumovirus (hMPV) infection may also occur year round, although the infection rates peak between December and February. The incidence of the common cold varies by age. Rates are highest in children younger than 5 years. Children have approximately 3-8 viral respiratory illnesses per year, while adolescents and adults have approximately 2-4 colds a year, and people older than 60 years have fewer than 1 cold per year. Viral and bacterial pharyngitis: Peaks in children aged 4-7 years. Serious complications may result in clinically significant morbidity and rare deaths. Fever, sneezing, and sore throat typically resolve early, whereas cough and nasal discharge are among the symptoms that last longest. Most patients with influenza recover within a week, although cough, fatigue, and malaise may persist for up to 2 weeks. For newborns, elderly persons, and patients with chronic medical conditions, the flu may be life threatening. More than 200,000 people per year are hospitalized because of complications of the flu, with 0.36 deaths per 100,000 patients occurring annually. Influenza may be followed by bacterial superinfection. Viral pharyngitis typically resolves in 1-2 weeks, but immunocompromised persons may have a more severe course. Mortality from group A streptococcal pharyngitis is rare, but serious morbidity or death may result from one of its complications. Streptococcal pharyngitis without complications rarely poses significant risk for morbidity. However, retropharyngeal, intraorbital, or intracranial abscesses may cause serious sequelae. The risk of mortality is significant in patients who progress to streptococcal toxic shock syndrome, which is characterized by multiorgan failure and hypotension. In patients with penicillin-sensitive streptococcal pharyngitis, symptomatic improvement is expected within 24-72 hours if antibiotic treatment is started in the first 24 hours after onset. Treatment failures are common and are mainly attributed to poor adherence, antibiotic resistance, and untreated close contacts, usually within the household or family. A chronic carrier state may develop with group A streptococcal infection. Eradicating the pathogen is difficult in these cases; however, carriers without active symptoms are unlikely to spread group A streptococci, and they are at low risk for developing rheumatic fever. With infectious mononucleosis from EBV, complete resolution of symptoms may take up to 2 months. Acute symptoms rarely last more than 4 months. EBV typically remains dormant throughout the patient's life. Reactivation of the virus is not usually symptomatic. The prognosis is generally favorable for acute rhinosinusitis, and many cases appear to resolve even without antibiotic therapy. As many as 70% of immunocompetent adults with rhinosinusitis begin to improve within 2 weeks of presentation without antibiotics. With antibiotics, up to 85% have improvement at 2 weeks. Complete resolution may take weeks to months. Epiglottitis poses a risk of death due to sudden airway obstruction and other complications, including septic arthritis, meningitis, empyema, and mediastinitis. In adults, epiglottitis has a fatality rate of approximately 1%. The prognosis is favorable with appropriate airway management, and most patients noticeably improve within 24-48 hours after antibiotics are started. Rarely, cases of epiglottitis may recur. Recurrent symptoms raise concern about potential underlying disorders, such as rheumatic conditions, sarcoidosis, and occult malignancy. With croup, laryngotracheobronchitis typically begins to improve within 3-4 days. Recovery is usually complete. However, patients may have a recurrence, including during the same season. Pertussis (whooping cough) leads to hospitalization in more than half of infants younger than 12 months and particularly in infants younger than 6 months. Infants and young children are most susceptible to severe courses that include respiratory compromise. Of infants who are hospitalized with pertussis, approximately 50% have apnea, 20% develop pneumonia, 1% have seizures, 1% die, and 0.3% have encephalopathy. Recovery from whooping cough is typically complete. However, paroxysms of coughing may last for several weeks. Airway hyperreactivity may increase after a URI, resulting in new or exacerbated asthma. Cough asthma, wherein a cough is the predominant manifestation of reactive airways disease, may mimic ongoing infection. This may be diagnosed with pulmonary function testing. A postinfectious cough is defined as coughing that persists 3-8 weeks after the onset of a URI in the absence of other clearly defined causes. Exacerbations of chronic obstructive pulmonary disease, including emphysema and chronic bronchitis, may occur during and after a URI. Upper airways cough syndrome (post-nasal drip) may result from upper airway secretions dripping onto the pharynx. Epistaxis may also occur. Lower respiratory tract disease and sepsis represent serious complications, especially in patients with immunocompromise. Lower respiratory tract disease should be considered when symptoms such as fever, cough, sputum, and malaise worsen progressively or after initial transient improvement. Tachypnea and dyspnea are also signs of lower respiratory involvement. Viral infection and resulting inflammation may make an individual susceptible to concomitant or sequential infection with a bacterial agent. Streptococcus pneumoniae, Staphylococcus aureus, H influenzae, and Streptococcus pyogenes are common superinfecting agents. Meningococci may cause superinfection with influenzal infections. Inflammation of the larynx and trachea area may lead to airway compromise, especially in children and in patients with narrowed airways due to congenital or acquired subglottic stenosis. The work of breathing during epiglottitis or laryngotracheitis may lead to respiratory failure. Sleep apnea may occur from hypertrophied tonsils. Deep tissue infection may occur by extension of the infection into the orbit, middle ear, cranium, or other areas. Peritonsillar abscess (quinsy) may complicate bacterial pharyngitis, leading to difficulty swallowing and pain radiating to the ear. Retropharyngeal abscess may also complicate pharyngitis. Lemierre syndrome is an extension of pharyngitis that leads to a suppurative thrombophlebitis of the internal jugular vein; septic thromboemboli may then spread throughout the body. Suspect a deep tissue infection when a patient has orbital or periorbital swelling, proptosis, impaired extraocular movements, or impaired vision. Signs of increased intracranial pressure (eg, papilledema, altered mental status, neurologic findings) may suggest intracranial involvement. Encephalitis, meningitis, or subarachnoid hemorrhage may follow a URI. Osteomyelitis may complicate persistent or recurrent sinusitis. Osteomyelitis may affect the orbital plate, frontal bone, or sphenoid bone. Mucoceles are expanding cystic defects of the paranasal sinuses that may result from prolonged sinusitis. Epiglottic abscess may result from epiglottitis. Lymphadenitis may follow or accompany URI. Guillain-Barré syndrome may manifest as an ascending polyneuropathy a few days or weeks after a URI. In children or adolescents, the use of aspirin during a viral infection may rarely cause Reye syndrome. Aspirin is contraindicated for the management of fevers in children or adolescents. URI, especially with fever, may increase the work of the heart, adding strain to persons with suboptimal cardiovascular status, and can lead to cardiovascular decompensation. Myositis or pericarditis may result from viral infection. Hyperglycemia may occur during a URI in patients with diabetes. Rib fracture may be seen following an episode of severe coughing, such as that associated with whooping cough. Hernia may develop following an episode of severe coughing. Cutaneous complications such as rash, cellulitis, and toxic shock syndrome may occur with group A streptococcus. This pathogen can also be associated with glomerulonephritis, acute rheumatic fever, and PANDAS syndrome (Pediatric Autoimmune Neuropsychiatric Disorders Associated with Streptococcal infections). Hemoptysis suggests the possibility of tuberculosis. A tuberculin skin test, chest radiography, or both are appropriate in these patients. Group A streptococcal pharyngitis is of special concern because its complications include streptococcal toxic shock syndrome, acute rheumatic fever (ARF), acute glomerulonephritis, and scarlet fever, as well as cutaneous infections. In addition, this pathogen is readily transmissible, especially in households, families, and other intimate groups. ARF affects approximately 3% of patients with strep throat, primarily occurring in persons aged 6-20 years. The condition develops approximately 2-4 weeks after streptococcal pharyngitis occurs, and it may last several months. Signs of rheumatic fever include arthritis, fever, and valvular disease. Uncommon features include an expanding truncal exanthem (erythema marginata), subcutaneous nodules, and chorea. Poststreptococcal glomerulonephritis can affect persons of any age group, but it is most common in children aged 3-7 years. Boys are affected slightly more often than girls. Patients with glomerulonephritis may have loss of appetite, lethargy, dull back pain, and dark urine. Blood pressure may be elevated, and edema may occur. Scarlet fever is a self-limited exanthem that spreads from the chest and abdomen to the entire body. Tiny red papules create a rough skin texture similar to that of sandpaper. The rash is typically blanching. Although it commonly affects the face, circumoral pallor is present. During recovery, the skin on the fingers and toes peels. Streptococcal toxic shock syndrome may also occur, affecting skin and mucosa. In addition, severe cough may result in rib fractures, hernia, incontinence, or subconjunctival hemorrhages. As with any systemic infection, the flu poses a risk of worsening underlying medical conditions, such as heart failure, asthma, or diabetes. After influenzal infection, children may experience sinus problems or otitis media. Address the patient's expectations about antibiotic therapy. Validate the patient's symptoms and their severity, listen to the concerns expressed, and educate the patient about possible consequences of inappropriate antibiotic use, including consequences affecting him/her and the community. Many people hold misperceptions about the duration and intensity of symptoms associated with URI and about the benefits and risks of antibiotic therapy. Some are unaware that cold symptoms may last as long as 14 days. Some believe that antibiotics will help them to avoid serious disease and recover more quickly than without treatment. Patients may expect to receive antibiotics solely based on the severity of their symptoms, and they may not appreciate the negative consequences of using antibiotics in viral disease. Negative results on a rapid strep test may provide reassurance about the appropriateness of supportive care. Actively promote self-care, and outline a realistic time course for the resolution of symptoms. Reassure the patient about access to clinical care and follow-up in the event that symptoms progress. Briefly explore factors that may have contributed to the current infection, and address prevention for the future. Patient satisfaction is less linked to antibiotic prescriptions and more linked to the quality of the physician-patient interaction. Reflecting understanding of the details of the patient's situation, expressing concern for the patient's well-being, explaining how recommendations are appropriately tailored to the individual's current condition, and providing reassurance are important to patient satisfaction. Patients should be counseled on handwashing and proper methods of covering coughs and sneezes. Patients who smoke should receive smoking cessation encouragement and materials. When antibiotics are prescribed, patients should be instructed to complete the full course of antibiotic therapy. Patients should be instructed to follow up when indicated or if symptoms worsen. Finally, patients with infectious mononucleosis should be instructed to avoid contact sports for 6 weeks because of the possibility of splenic rupture. For patient education information, see the Headache and Migraine Center, as well as Sinus Infection and Sore Throat. [Guideline] Bisno AL, Gerber MA, Gwaltney JM Jr, Kaplan EL, Schwartz RH. Diagnosis and management of group A streptococcal pharyngitis: a practice guideline. Infectious Diseases Society of America. Clin Infect Dis. 1997 Sep. 25(3):574-83. [Medline]. [Guideline] Shulman ST, Bisno AL, Clegg HW, Gerber MA, Kaplan EL, Lee G, et al. Clinical practice guideline for the diagnosis and management of group A streptococcal pharyngitis: 2012 update by the Infectious Diseases Society of America. Clin Infect Dis. 2012 Nov 15. 55(10):1279-82. [Medline]. [Full Text]. [Guideline] Wald ER, Applegate KE, Bordley C, Darrow DH, Glode MP, Marcy SM, et al. Clinical practice guideline for the diagnosis and management of acute bacterial sinusitis in children aged 1 to 18 years. Pediatrics. 2013 Jul. 132(1):e262-80. [Medline]. Utah Department of Health, Bureau of Epidemiology. Whooping Cough Sound Files. Utah Department of Health, Bureau of Epidemiology. Available at http://health.utah.gov/epi/diseases/pertussis/pertussis_sounds.htm. Accessed: November 29, 2012. Centers for Disease Control and Prevention. Pertussis (Whooping Cough): Clinical Features. Available at http://www.cdc.gov/pertussis/clinical/features.html. Accessed: October 27, 2013. Ahovuo-Saloranta A, Borisenko OV, Kovanen N, Varonen H, Rautakorpi UM, Williams JW Jr, et al. Antibiotics for acute maxillary sinusitis. Cochrane Database Syst Rev. 2008 Apr 16. CD000243. [Medline]. [Guideline] Chow AW, Benninger MS, Brook I, Brozek JL, Goldstein EJ, Hicks LA, et al. IDSA clinical practice guideline for acute bacterial rhinosinusitis in children and adults. Clin Infect Dis. 2012 Apr. 54(8):e72-e112. [Medline]. [Full Text]. Chung LP, Waterer GW. Genetic predisposition to respiratory infection and sepsis. Crit Rev Clin Lab Sci. 2011 Sep-Dec. 48(5-6):250-68. [Medline]. Horby P, Nguyen NY, Dunstan SJ, Baillie JK. The role of host genetics in susceptibility to influenza: a systematic review. PLoS One. 2012. 7(3):e33180. [Medline]. [Full Text]. Juno J, Fowke KR, Keynan Y. Immunogenetic factors associated with severe respiratory illness caused by zoonotic H1N1 and H5N1 influenza viruses. Clin Dev Immunol. 2012. 2012:797180. [Medline]. [Full Text]. Meriluoto M, Hedman L, Tanner L, Simell V, Mäkinen M, Simell S, et al. Association of human bocavirus 1 infection with respiratory disease in childhood follow-up study, Finland. Emerg Infect Dis. 2012 Feb. 18(2):264-71. [Medline]. [Full Text]. National Center for Infectious Diseases. Division of Bacterial and Mycotic Diseases. Haemophilus influenzae serotype b (Hib) disease. Centers for Disease Control and Prevention. Available at http://www.cdc.gov/hi-disease/clinicians.html. Accessed: November 29, 2012. National Center for Infectious Diseases. Respiratory and Enteric Viruses Branch. Human parainfluenza viruses (HPIVs). Centers for Disease Control and Prevention. Available at http://www.cdc.gov/ncidod/dvrd/revb/respiratory/hpivfeat.htm. Accessed: April 30, 2009. [Guideline] Schwartz SR, Cohen SM, Dailey SH, et al. Clinical practice guideline: hoarseness (dysphonia). Otolaryngol Head Neck Surg. 2009 Sep. 141(3 Suppl 2):S1-S31. [Full Text]. Fagnan LJ. Acute sinusitis: a cost-effective approach to diagnosis and treatment. Am Fam Physician. 1998 Nov 15. 58(8):1795-802, 805-6. [Medline]. Centers for Disease Control and Prevention. Accessed April 30, 2009. Nonspecific upper respiratory tract infection. Available at http://www.cdc.gov/drugresistance/community/hcp-info-sheets/adult-nurti.pdf. Isakson M, Hugosson S. Acute epiglottitis: epidemiology and Streptococcus pneumoniae serotype distribution in adults. J Laryngol Otol. 2011 Apr. 125(4):390-3. [Medline]. Centers for Disease Control and Prevention. Pertussis (Whooping Cough) Surveillance & Reporting. Available at http://www.cdc.gov/pertussis/surv-reporting.html. Accessed: June 12, 2012. Bettiol S, Wang K, Thompson MJ, Roberts NW, Perera R, Heneghan CJ, et al. Symptomatic treatment of the cough in whooping cough. Cochrane Database Syst Rev. 2012 May 16. 5:CD003257. [Medline]. Centers for Disease Control and Prevention. Outbreaks of respiratory illness mistakenly attributed to pertussis--New Hampshire, Massachusetts, and Tennessee, 2004-2006. MMWR Morb Mortal Wkly Rep. 2007 Aug 24. 56(33):837-42. [Medline]. [Full Text]. CDC Centers for Disease Control and Prevention. Seasonal Influenza (Flu). Centers for Disease Control and Prevention. Available at http://www.cdc.gov/flu/about/disease/index.htm. Accessed: June 12, 2012. National Center for Infectious Diseases. Division of Bacterial and Mycotic Diseases. Epstein-Barr virus and infectious mononucleosis. Centers for Disease Control and Prevention. Available at http://www.cdc.gov/ncidod/diseases/ebv.htm. Accessed: April 30, 2009. Centers for Disease Control and Prevention. CDC. Diphtheria. Centers for Disease Control and Prevention. CDC.gov. Available at http://www.cdc.gov/ncidod/dbmd/diseaseinfo/diptheria_t.htm. Accessed: June 12, 2012. National Institute of Allergy and Infectious Diseases. Common Cold. National Institute of Allergy and Infectious Diseases. Available at http://www.niaid.nih.gov/topics/commoncold/Pages/default.aspx. Accessed: June 12, 2012. Wald ER, Guerra N, Byers C. Upper respiratory tract infections in young children: duration of and frequency of complications. Pediatrics. 1991 Feb. 87(2):129-33. [Medline]. CDC. Centers for Disease Control and Prevention. Seasonal Influenza (Flu): Seasonal Influenza-Associated Hospitalizations in the United States. Centers for Disease Control and Prevention. Available at http://www.cdc.gov/flu/about/qa/hospital.htm. Accessed: November 29, 2012. CDC. Centers for Disease Control and Prevention. Pertussis (Whooping Cough): Clinical Complications. Available at http://www.cdc.gov/pertussis/clinical/complications.html. Accessed: June 12, 2012. Arola M, Ruuskanen O, Ziegler T, Mertsola J, Näntö-Salonen K, Putto-Laurila A, et al. Clinical role of respiratory virus infection in acute otitis media. Pediatrics. 1990 Dec. 86(6):848-55. [Medline]. Shulman ST. Pediatric autoimmune neuropsychiatric disorders associated with streptococci (PANDAS): update. Curr Opin Pediatr. 2009 Feb. 21(1):127-30. [Medline]. National Institute of Allergy and Infectious Diseases. Common Cold: Symptoms. Available at http://www.niaid.nih.gov/topics/commonCold/Pages/symptoms.aspx. Accessed: October 17, 2013. [Guideline] Division of STD Prevention, CDC. Gonococcal Infections. Sexually Transmitted Diseases Treatment Guidelines, 2010. Centers for Disease Control and Prevention. Available at http://www.cdc.gov/std/treatment/2010/gonococcal-infections.htm. Accessed: November 29, 2012. Vincent MT, Celestin N, Hussain AN. Pharyngitis. Am Fam Physician. 2004 Mar 15. 69(6):1465-70. [Medline]. CDC. Centers for Disease Control and Prevention. Pertussis (Whooping Cough): Specimen Collection. Full text: http://cid.oxfordjournals.org/content/early/2012/09/06/cid.cis629.full. Available at http://www.cdc.gov/pertussis/clinical/diagnostic-testing/specimen-collection.html. Accessed: October 17, 2013. Chow AW. Acute sinusitis: current status of etiologies, diagnosis, and treatment. Curr Clin Top Infect Dis. 2001. 21:31-63. [Medline]. [Guideline] Workowski KA, Berman SM. Sexually transmitted diseases treatment guidelines, 2006. MMWR Recomm Rep. 2006 Aug 4. 55:1-94. [Medline]. [Full Text]. CDC. Centers for Disease Control and Prevention. Pertussis (Whooping Cough): Diagnostic Testing. Centers for Disease Control and Prevention. Available at http://www.cdc.gov/pertussis/clinical/diagnostic-testing/index.html. Accessed: November 29, 2012. Ragosta KG, Orr R, Detweiler MJ. Revisiting epiglottitis: a protocol--the value of lateral neck radiographs. J Am Osteopath Assoc. 1997 Apr. 97(4):227-9. [Medline]. MacReady N. AAP Releases New Principles for URI Antibiotics. Medscape Medical News. Available at http://www.medscape.com/viewarticle/814533. Accessed: November 26, 2013. Hersh AL, Jackson MA, Hicks LA. Principles of Judicious Antibiotic Prescribing for Bacterial Upper Respiratory Tract Infections in Pediatrics. Pediatrics. 2013 Nov 18. [Medline]. Little P, Moore M, Kelly J, et al. Delayed antibiotic prescribing strategies for respiratory tract infections in primary care: pragmatic, factorial, randomised controlled trial. BMJ. 2014 Mar 6. 348:g1606. [Medline]. [Full Text]. Kissoon N, Mitchell I. Adverse effects of racemic epinephrine in epiglottitis. Pediatr Emerg Care. 1985 Sep. 1(3):143-4. [Medline]. Weber JE, Chudnofsky CR, Younger JG, Larkin GL, Boczar M, Wilkerson MD, et al. A randomized comparison of helium-oxygen mixture (Heliox) and racemic epinephrine for the treatment of moderate to severe croup. Pediatrics. 2001 Jun. 107(6):E96. [Medline]. [Guideline] Irwin RS, Baumann MH, Bolser DC, Boulet LP, Braman SS, Brightling CE, et al. Diagnosis and management of cough executive summary: ACCP evidence-based clinical practice guidelines. Chest. 2006 Jan. 129(1 Suppl):1S-23S. [Medline]. Update: influenza activity - United States, September 28, 2008--January 31, 2009. MMWR Morb Mortal Wkly Rep. 2009 Feb 13. 58(5):115-9. [Medline]. [Full Text]. van den Aardweg MT, Boonacker CW, Rovers MM, Hoes AW, Schilder AG. Effectiveness of adenoidectomy in children with recurrent upper respiratory tract infections: open randomised controlled trial. BMJ. 2011 Sep 6. 343:d5154. [Medline]. [Full Text]. Harvey R, Hannan SA, Badia L, Scadding G. Nasal irrigation with saline (salt water) for the symptoms of chronic rhinosinusitis. Cochrane Database Syst Rev. January 24, 2007. Issue 3:[Medline]. [Full Text]. Rabago D, Zgierska A, Mundt M, Barrett B, Bobula J, Maberry R. Efficacy of daily hypertonic saline nasal irrigation among patients with sinusitis: a randomized controlled trial. J Fam Pract. 2002 Dec. 51(12):1049-55. [Medline]. [Full Text]. Paul IM, Beiler J, McMonagle A, Shaffer ML, Duda L, Berlin CM Jr. Effect of honey, dextromethorphan, and no treatment on nocturnal cough and sleep quality for coughing children and their parents. Arch Pediatr Adolesc Med. 2007 Dec. 161(12):1140-6. [Medline]. [Full Text]. Sharfstein JM, North M, Serwint JR. Over the counter but no longer under the radar--pediatric cough and cold medications. N Engl J Med. 2007 Dec 6. 357(23):2321-4. [Medline]. Food and Drug Administration. FDA Statement Following CHPA's Announcement on Nonprescription Over-the-Counter Cough and Cold Medicines in Children. FDA: U.S. Food and Drug Administration. Available at http://www.fda.gov/bbs/topics/NEWS/2008/NEW01899.html. Accessed: May 10, 2009. Wiklund L, Stierna P, Berglund R, Westrin KM, Tonnesson M. The efficacy of oxymetazoline administered with a nasal bellows container and combined with oral phenoxymethyl-penicillin in the treatment of acute maxillary sinusitis. Acta Otolaryngol Suppl. 1994. 515:57-64. [Medline]. Hayden FG, Diamond L, Wood PB, Korts DC, Wecker MT. Effectiveness and safety of intranasal ipratropium bromide in common colds. A randomized, double-blind, placebo-controlled trial. Ann Intern Med. 1996 Jul 15. 125(2):89-97. [Medline]. Turner RB, Sperber SJ, Sorrentino JV, O'Connor RR, Rogers J, Batouli AR, et al. Effectiveness of clemastine fumarate for treatment of rhinorrhea and sneezing associated with the common cold. Clin Infect Dis. 1997 Oct. 25(4):824-30. [Medline]. [Guideline] American Academy of Pediatrics. Clinical practice guideline: management of sinusitis. Pediatrics. 2001 Sep. 108(3):798-808. [Medline]. Zalmanovici A, Yaphe J. Steroids for acute sinusitis. Cochrane Database Syst Rev. 2007 Apr 18. CD005149. [Medline]. American Academy of Pediatrics. Use of codeine- and dextromethorphan-containing cough remedies in children. American Academy of Pediatrics. Committee on Drugs. Pediatrics. 1997 Jun. 99(6):918-20. [Medline]. Wing A, Villa-Roel C, Yeh B, Eskin B, Buckingham J, Rowe BH. Effectiveness of corticosteroid treatment in acute pharyngitis: a systematic review of the literature. Acad Emerg Med. 2010 May. 17(5):476-83. [Medline]. Hirt M, Nobel S, Barron E. Zinc nasal gel for the treatment of common cold symptoms: a double-blind, placebo-controlled trial. Ear Nose Throat J. 2000 Oct. 79(10):778-80, 782. [Medline]. United States Food and Drug Administration. Accessed June 16, 2009. Zicam cold remedy nasal products (Cold Remedy Nasal Gel, Cold Remedy Nasal Swabs, and Cold Remedy Saws, Kids Size). MedWatch Public Health Advisory. Available at http://www.fda.gov/Safety/MedWatch/SafetyInformation/SafetyAlertsforHumanMedicalProducts/ucm166996.htm. Singh M, Das RR. Zinc for the common cold. Cochrane Database Syst Rev. 2011 Feb 16. 2:CD001364. [Medline]. Taylor JA, Weber W, Standish L, Quinn H, Goesling J, McGann M, et al. Efficacy and safety of echinacea in treating upper respiratory tract infections in children: a randomized controlled trial. JAMA. 2003 Dec 3. 290(21):2824-30. [Medline]. Barrett B, Brown R, Rakel D, Mundt M, Bone K, Barlow S, et al. Echinacea for treating the common cold: a randomized trial. Ann Intern Med. 2010 Dec 21. 153(12):769-77. [Medline]. Brinckmann J, Sigwart H, van Houten Taylor L. Safety and efficacy of a traditional herbal medicine (Throat Coat) in symptomatic temporary relief of pain in patients with acute pharyngitis: a multicenter, prospective, randomized, double-blinded, placebo-controlled study. J Altern Complement Med. 2003 Apr. 9(2):285-98. [Medline]. D'Souza AL, Rajkumar C, Cooke J, Bulpitt CJ. Probiotics in prevention of antibiotic associated diarrhoea: meta-analysis. BMJ. 2002 Jun 8. 324(7350):1361. [Medline]. Walsh NP, Gleeson M, Shephard RJ, Gleeson M, Woods JA, et al. Position statement. Part one: Immune function and exercise. Exerc Immunol Rev. 2011. 17:6-63. [Full Text]. Kretsinger K, Broder KR, Cortese MM, Joyce MP, Ortega-Sanchez I, Lee GM, et al. Preventing tetanus, diphtheria, and pertussis among adults: use of tetanus toxoid, reduced diphtheria toxoid and acellular pertussis vaccine recommendations of the Advisory Committee on Immunization Practices (ACIP) and recommendation of ACIP, supported by the Healthcare Infection Control Practices Advisory Committee (HICPAC), for use of Tdap among health-care personnel. MMWR Recomm Rep. 2006 Dec 15. 55:1-37. [Medline]. [Full Text]. [Guideline] Workowski KA, Levine WC. Sexually transmitted diseases treatment guidelines: 2002 [Centers for Disease Control and Prevention Web site]. MMWR. 2002. 51(RR06):1-80. [Full Text]. American Academy of Pediatrics. Prevention of pertussis among adolescents: recommendations for use of tetanus toxoid, reduced diphtheria toxoid, and acellular pertussis (Tdap) vaccine. Pediatrics. 2006 Mar. 117(3):965-78. [Medline]. [Guideline] Safer Healthier PeopleCenters for Disease Control and Prevention. Pertussis: Summary of Vaccine Recommendations. Safer Healthier People. Available at http://www.cdc.gov/vaccines/vpd-vac/pertussis/recs-summary.htm. Accessed: 02/10/2011. US Food and Drug Administration. FDA Statement regarding azithromycin (Zithromax) and the risk of cardiovascular death. Available at http://www.fda.gov/Drugs/DrugSafety/ucm304372.htm. March 12, 2013; Accessed: February 17, 2017. CT scan of the sinuses demonstrates maxillary sinusitis. The left maxillary sinus is completely opacified (asterisk), and the right has mucosal thickening (arrow). Courtesy of Omar Lababede, MD, Cleveland Clinic Foundation. Gonococcal pharyngitis. Image credit: CDC Public Health Image Library (Flumara NJ, Hart G). Strep throat with petechiae. CDC Public Health Image Library (Eichenwald HF).